Some posts call for a lot of words, a lot of information and such is the case of yesterday's article and many others are just images of daily life, snapshots, frozen moments that speak for themselves. In a way I prefer these sort of pictures, spontaneous acts of human activity like taking the dogs out for a walk. I was lucky there was this staircase from which you have a nice view over the forum area, right next to the famous big solar panel by the sea. 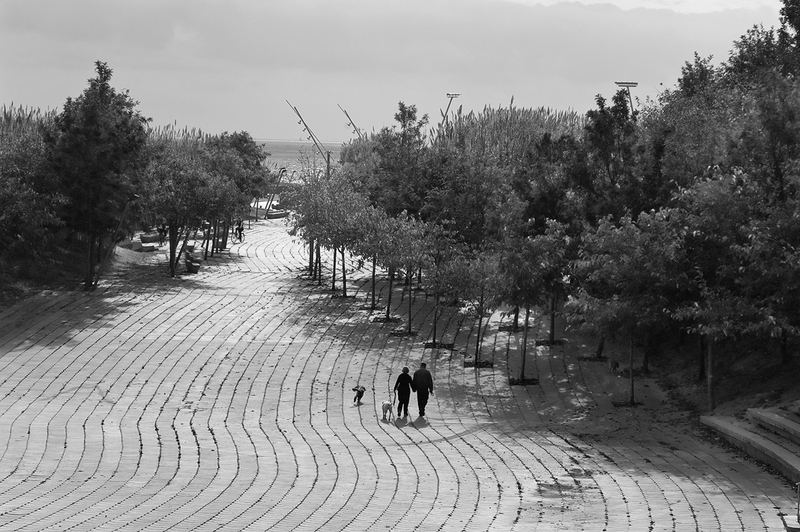 A tiny couple getting lost in the distance along the many paths drawn by the floor tiles towards the sea, accompanied but the silence of the trees and the light. I love the starkness and shapes on this photograph. The contrast between the wavy pavement and trees is hypnotic. Yes, Gary. I was in doubt about showing the autumn colors of the trees but finally I decided over the shapes on the floor and the tonal variations of the shadows. The couple is tiny but they look nice in the larger format. You got the whole idea about the atmosphere, hypnotic. What a nice proof that the tides of life can indeed be filled with calm and peacefulness. Please have a good Friday.